I can ship anywhere worldwide, please message me for a shipping quote based on your location. New! - Choose the type of Schedule/Income Tracking Section you'd like! 4 formats available. See pictures for details. This can be personalized with your name on the front cover if you wish. Let me know in the Notes to Seller section at checkout. The Deluxe organizational binder is perfect for those in the salon or any small business! The name of this book is DOT - which stands for Data, Organizing, Tracking. It's a Yearly Workbook and it's main purpose is to keep track of income and expenses for tax time, but it does include other important sections for salons. - Schedule with weekly income - Choose from Standard Dot Book Format, 5 Day-Week Undated, 6 Day/Week Undated or 6 Day/Week PreDated. See pictures for details. Descriptions are below. - Format 1: Standard Dot Book format - can be used for scheduling appointments, but it's main use is for tracking income. - Format 2: 5 Day/Week Mini Appointment Book Section includes income tracking at bottom of each daily column and weekly income tracking on a side bar. This format is UNDATED and sorry, but it cannot be dated for you. - Format 3: 6 Day/Week Mini Appointment Book Section - UNDATED - includes income tracking at bottom of each daily column. - Format 4: 6 Day/Week Appointment Book Section - PREDATED WITH NO SUNDAYS. This is Monday - Saturday only and includes income tracking at the bottom of each daily column. (7 Day Per week will not fit in this smaller book. If you'd like a 7 day/week format I do have them in my larger appointment books). The binder comes in a handy, portable size of 5 1/2" x 8 1/2" in your choice of red, aqua or white. 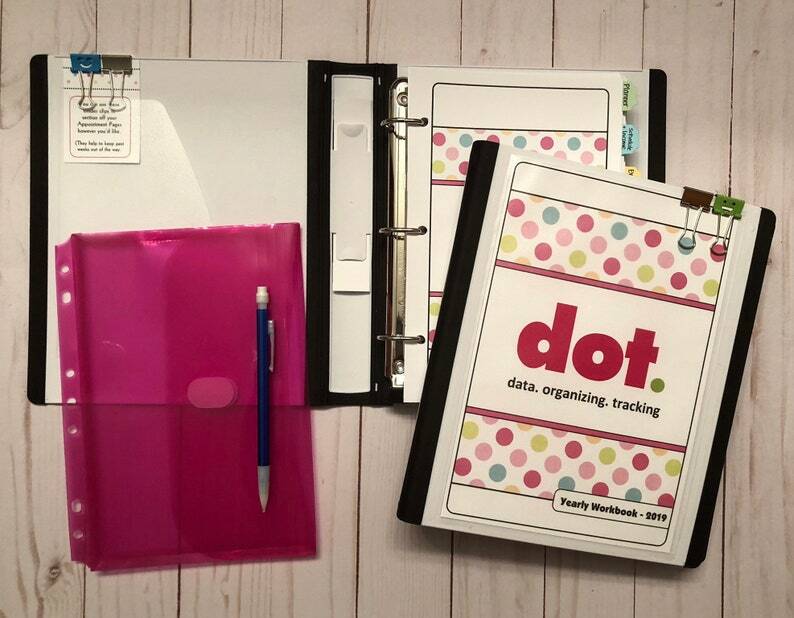 Each Premium high-quality binder includes a small calculator, plastic pouch for holding money and/or receipts, 2 binder clips for sectioning off pages, and a mechanical pencil to get you started with complete organization. (Calculator, plastic pouch, binder clips and pencil colors will vary with each order). This item ships to you completely printed and assembled with divider pages. Not available for digital download. This income and expense organizer helps to keep my things organized. With a lot of cash transactions it helps me to keep my financials in order also. Great for self-employed bookkeeping! I am really excited to be organized going into 2018. Shipping was super quick.